Why at this point a separate page about the Main? Well, from the tourist point of view there ist the bikeway “Mainrad” along the river for instance. However, the Main as a whole is so important for the region and Ochsenfurt, that at this point a chapter of its own has to be devoted to it. Ochsenfurt is not just a beer town. The fact that a city like Ochsenfurt in Franconia despite its manageable size has two breweries does not surprise in Bavaria. In terms of brewery, Bavaria is leading in Germany. Even more. There is no larger collection of beer brewers in Europe than in Franconia. The beer, however, followed the wine. Once upon a time, the wine heavily struggled with a mean louse. The more detailed circumstances are described here. Nevertheless, the wine not only characterizes the culture and in former times the economy of the region. In addition, wine growing is the main feature of Mainfranken. Thus, not a few small districts along the river have their pretty medieval walls ultimately due to the vines. And what definitely belongs to winegrowing? In addition to the hillside? The appropriate climate of course. The weather in Mainfranken is always somewhat better than in many other regions of Germany. And in an investigation from the last decade, Franconia was even assigned the most beautiful weather in Germany. Mainfranken in turn is not only one of the driest regions in Germany, but also by far the driest zone in Bavaria. Even though the locals – what is so much typically for every region, isn’t it? – frequently complain about their supposed “Schmuddelwetter” (lousy weather). Fact is: Climate change does not know any borders. Storms and floods are also increasing here. It is no coincidence that the highest temperature ever measured in Germany was measured in the “Maindreieck” (the region somewhere between Gemünden, Schweinfurt and Ochsenfurt). Strictly speaking in Kitzingen. The importance of the Main can not only be determined by the numerous wine festivals. Leaving the valley of the river Main and driving or going up the slopes, the varied character of the region quickly disappears. If you are expecting mountains or a hilly landscape – typical for South Germany – you will be taught something else there. The Main defines the profile of the region and is at the same time a natural geographic outlier. At the end of the Ice Age, the river and its smaller side-branches cut into the plain of the region and formed the landscape. At the same time, of course, the Main changed a lot since the last Ice Age. Even under Charles the Great, there were efforts to achieve the idea of ​​a complete connection between the rivers Rhine, Main and Danube. Over time, excavation and straightening have taken place, which has led to a sustained transformation of river moors and meandering. And yet, if you ride along the Main, you will find only few straight forms. Rather, there are here and there edges, jags, indentations or small islets in the course of the river. The floodplain is lined with many open spaces where the branches of mighty trees rise into the water. What remains: a river, a waterway that could maintain its natural character better than other important water bodies in Europe. The Main in Ochsenfurt shows this supposed naturalness in many places. The Main offers services not only to transport and industry, but also to tourism and recreation. The naturalness of the Main as a whole is also reflected in the distinction of the Main Cycle Route. As the first of its kind, the 600 km long line from the Ochsenkopf, or Creußen to Mainz-Kastel from the ADFC (german bicycle association) was awarded five stars for its natural and scenic areas. The fact that Ochsenfurt is located on this main bikeway can be felt anywhere in town indeed. Cyclists are nearely always and everywhere present here. No wonder, the section between Ochsenfurt and Würzburg offers pure nature and many, highly picturesque tourist impressions. In addition to Ochsenfurt itself, the bikeway leads for instance through the small, but adorable-romantic Markt Sommerhausen only 3 miles upriver. The “Nixe” (the name of a small ferry boat) is well-known in Ochsenfurt today. Since 2007, the small ship has been placing passengers across the river after the old Main Bridge was closed for years due to refurbishment work. After completion of the work, the Nixe had actually done its service. 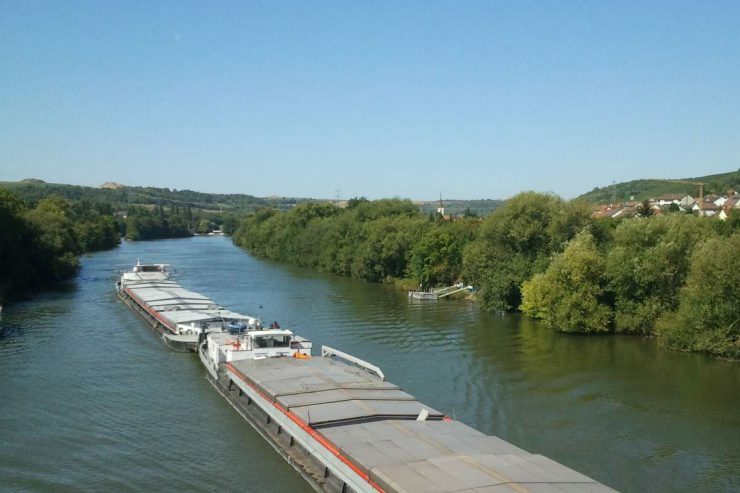 However, the ferry arrived so well that it has now become an integral part of Ochsenfurt. To the north of the old town and to the east is a popular recreation area. There are always strollers and mounted horses, which are located in the Riding Club of Ochsenfurt. If you cross the river via the new bridge (which is not possible at the moment, because this new bridge is in fact again newly built) and you look to the right, you see a sport center with ennis courts and outdoor swimming pools among others. This area is actually located on a small river island, the Main Insel. 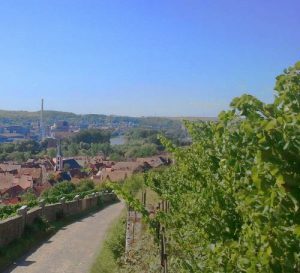 In the south of the city, walking along the wide river bank towards the east, the old town with its medium-Franconian appearance in the back on the one side and the sugar factory on the other move more and more into the field of view. A triumvirate of a beautiful floodplain, a factory site and a medieval town, which you shouldn’t miss. The sugar factory as an important trade tax, in turn, would certainly not exist in Ochsenfurt without the Main. The former “Zuckerfabrik Franken GmbH” merged with the “Süddeutsche-Zucker-AG” in 1988, forming the Südzucker AG Mannheim / Ochsenfurt: The largest sugar producer in the world. If you want, you can walk along the river to the nearby Marktbreit. The small town at the southernmost point of the Maindreieck (the word “Dreieck” means triangle in english by the way!) offers some charming sights. Absolutely recommendable: The Malerwinkelhaus. There, for example the permanent exhibition “Römerkabinett” can be visited, showing artifacts from the Romans who had a big camp here, 2.000 years ago.